1 Platinum Hot Box per 8-box mini case! All cards numbered to 999 or less! 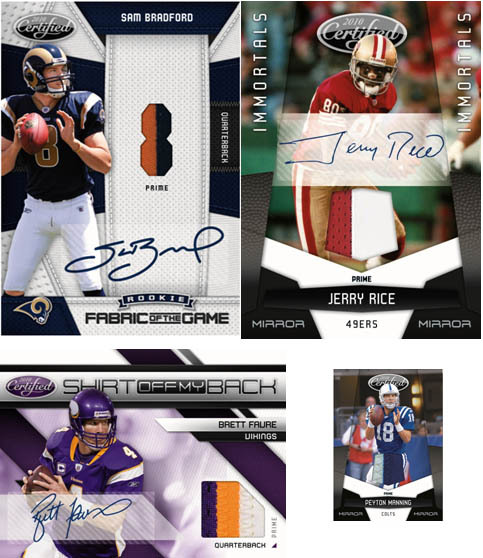 Autographed Material Rookie Cards “Freshman Fabric" featuring Sam Bradford, C.J. Spiller, Ryan Matthews, Dez Bryant and Tim Tebow numbered to 699 or less! Look for Mirror Material Gold, Emerald and Black cards featuring prime swatches of material numbered to 25 or less! 150 Commons 35 Freshman Fabric Rookies #'d to 699 or less! Certified is all about the numbering. Every card in the latest rendition of Certified football is numbered to 999 or less. Other perks of Panini's mid-high end offering include the presence of 1 Platinum Hot Box per case and plenty of 2010 NFL rookies, current NFL stars, and retired Legends.